Today, I received a phone call from Gordon Brown to tell me that Duncan Winning OBE died yesterday. He had been ill for some time. I send my sincere condolences to Duncan's family. 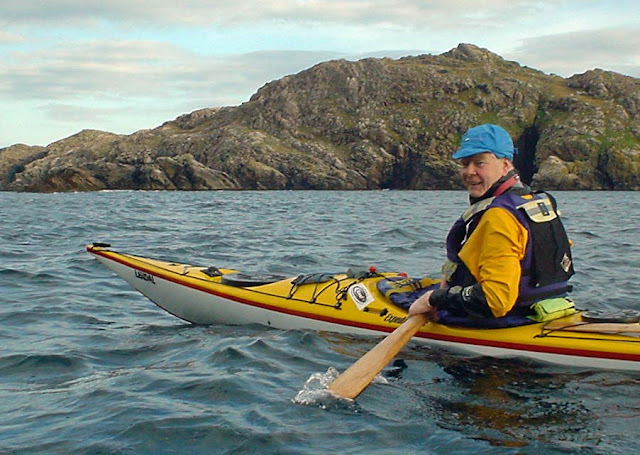 Duncan was a father figure in Scottish sea kayaking and because he gave of his time generously, he started many people off on a lifetime of sea kayaking adeventures. So many people have stories about Duncan but I have never heard a bad word about him, he was a true gentleman. I was fortunate to paddle with Duncan on many occasions over the years and how we talked! We were both interested in the history of recreational kayaking (or KAY-a-king as Duncan called it). Of course I was the student and he was the master. 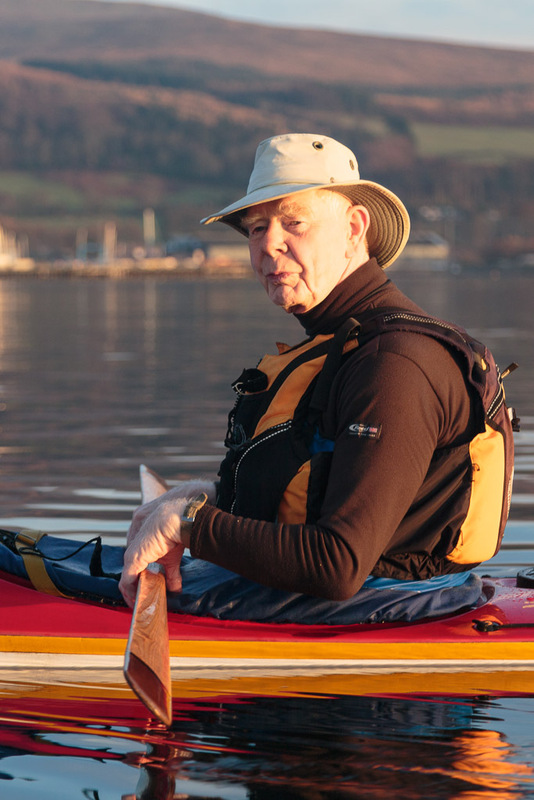 Indeed Duncan not only had an encyclopaedic knowledge of kayaking history, he was actually a very important part of its history himself. Duncan was very proud of the fact that all the boats he had owned and paddled since the age of 14 years had been designed by himself. This photo shows Duncan in one of his designs, the GRP Explorer by Island Kayaks of Skye. We would get so engrossed in our discussions that we would fall far behind the others and finish after dark. 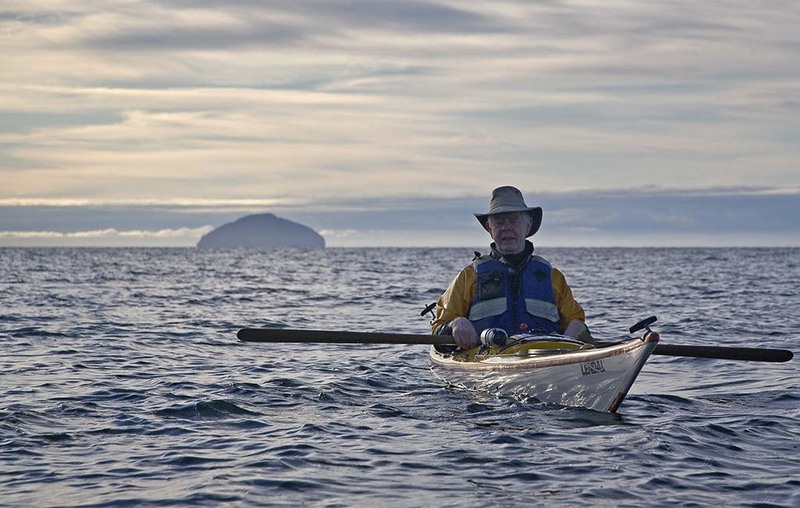 I was lucky to paddle with Duncan many times on our home waters of the Firth of Clyde but we also paddled together in the Inner and Outer Hebrides and at the alternating sea kayak symposiums at Skye and Jersey, where he was one of the organisers. Duncan had visited the Outer Hebrides over a period of over 40 years. On one of his first visits he and his friend Joe Reid had been caught in a great storm. They were lucky enough to have found a tiny sheltered cove. He was very keen to find that particular shell sand cove again which was hidden away in the fastnesses of Loch Roag, a huge sea loch on the west coast of Lewis. Unfortunately he could not remember exactly where it was because the storm had blown their map away. 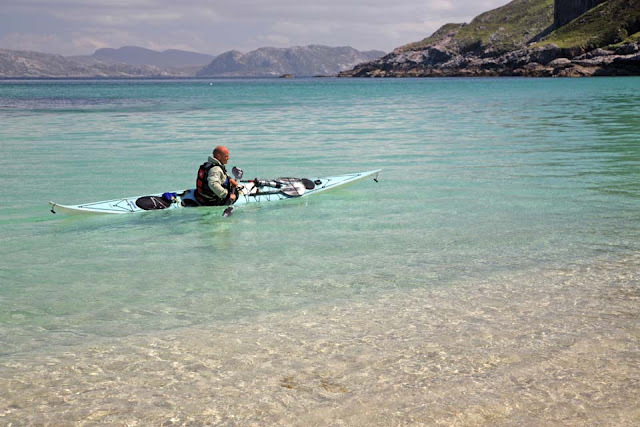 During the course of a day's paddle, we stopped at many beautiful white sand Hebridean coves but none was the right one. At last, just as the day was fading, we found Duncan's cove. It was a wonderful moment to share with Duncan. Duncan's day job also involved the sea. 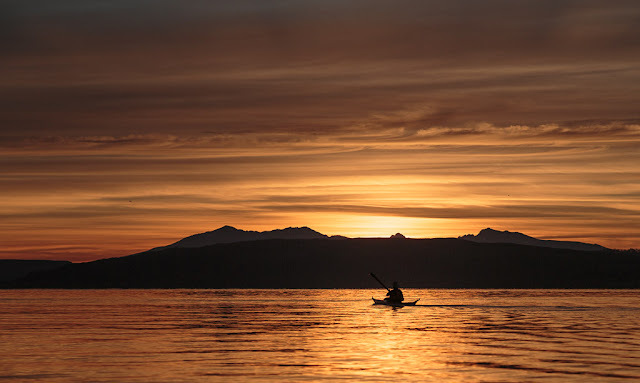 He was an engine room draughtsman in Kincaid's shipyard at Greenock but his true love was designing and building kayaks. 1960 Duncan paddled a kayak that Ken Taylor brought back from Illorsuit (Igdlorssuit) in Greenland. Duncan was so impressed by the handling of this kayak that all his subsequent designs were influenced by it. 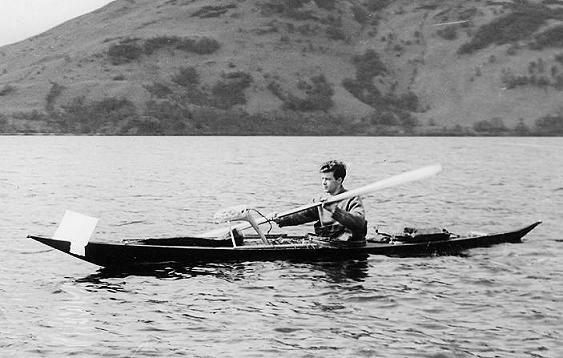 The above photo taken in 1960 shows Ken in the Igdlorssuit kayak, which had been made for him by local kayak builder Emanuele Korniliussen in 1959. It is now in the Kelvingrove museum in Glasgow, Scotland. Ken and Duncan were fellow members of Scottish Hostellers Canoe Club. When Ken left to live in the USA he left the kayak in the care of Duncan and Joe Reid who had taught Duncan to paddle. 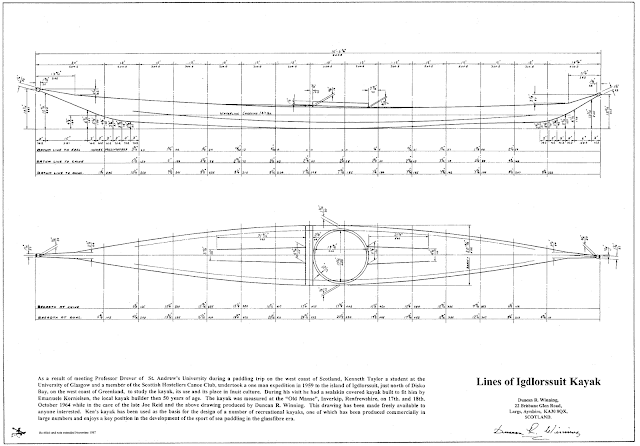 In 1964 Duncan carefully measured the kayak and made the detailed drawing below. 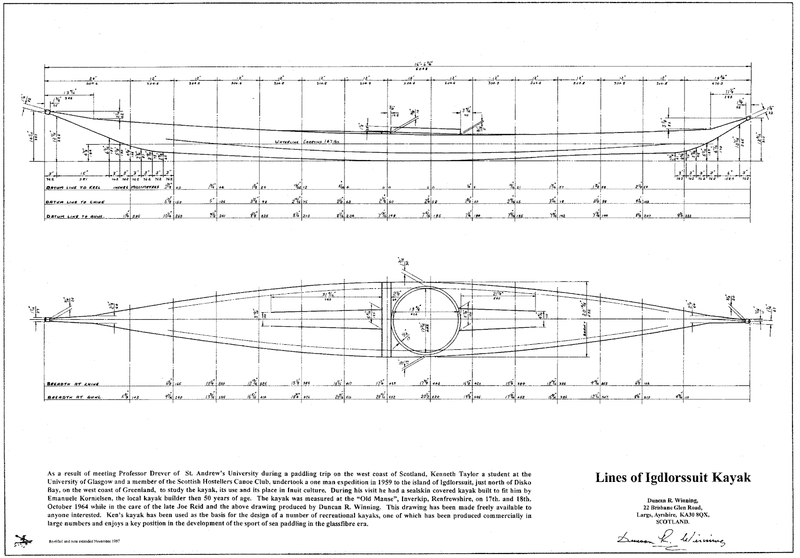 Duncan freely shared this drawing throughout the small sea kayaking community of the time. Geoff Blackford was one of the people who built a ply-wood version from Duncan's drawing and called it the Anas Acuta. In 1972 Valley started to commercially build a GRP version of the Anas Acuta, which is still in production and to this day has infused the British style of sea kayaks with Igdlorssuit roots. 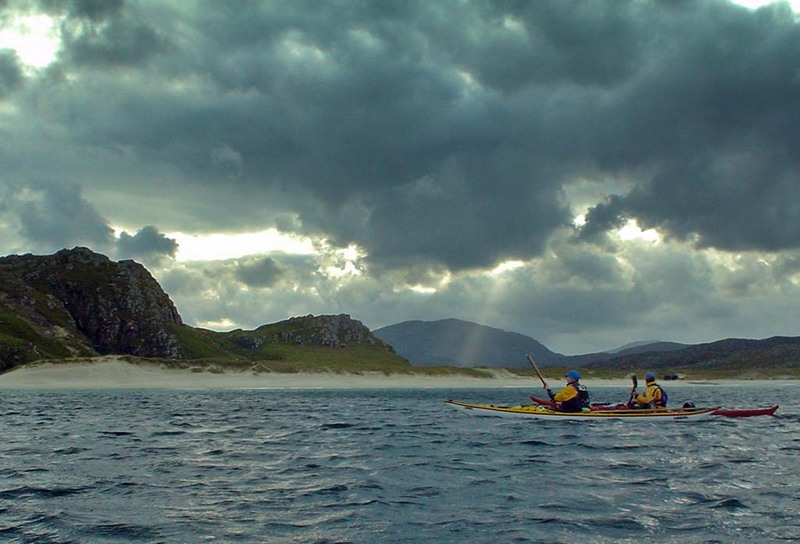 This photo shows Andy Spink paddling an Anas Acuta in the waters of Scarp in the Outer Hebrides. Due to a series of surgical operations I was off the water for some time but Duncan and I kept up our long conversations by phone and, until I could visit him, Duncan came to visit me. I have no doubt that his time spent with me aided and sped my recovery. The last time Duncan and I paddled together was in November 2014. We paddled till long after sunset. It seems just like yesterday. The last time I saw Duncan was about a year ago at Portencross on his beloved Firth of Clyde. His health problem prevented him paddling that day but we enjoyed another of our long conversations. What a loss his passing is. He was a thoroughly decent and modest family man. 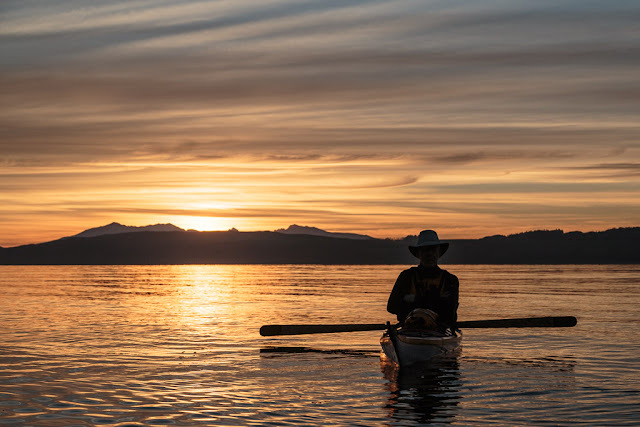 His influence in his chosen recreation of sea kayaking is immeasurable due to his gift of time to others, willingness to share knowledge and quiet leadership. Farewell Duncan and thank you.